With the New Year comes several new faces in the office! Our most recent full-time Utilians include (from left to right) Casey Williams, a designer who recently moved to Boston after graduating from University of Oregon with her Bachelor of Architecture, and Tayler Morris, our office assistant who graduated from Hollins University in Roanoke, VA with a major in Political Science and International Studies. Our spring semester Co-ops are Ben Epstein and Zoe Wong, both pursuing their B.S. in Architecture from Northeastern University. Intern Angeline Jacques joins Utile for the month of January, and is currently pursuing her Master of Architecture at MIT after earning her B.A. in Architecture from Princeton University. And last but not least, Joshua Cruz is a Master of Architecture candidate at University of Virginia (also holding a B.S. 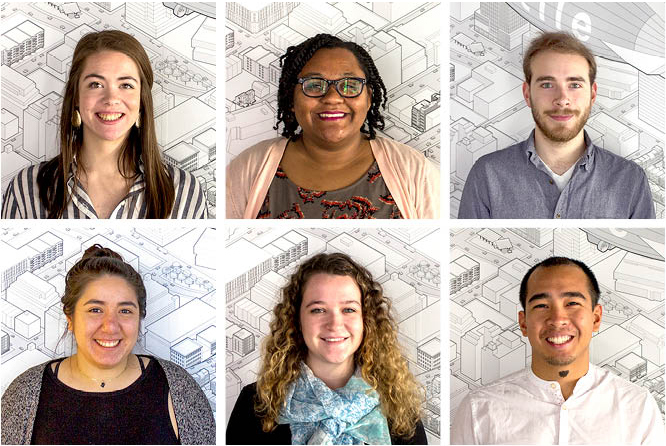 in Architecture from the school) and is joining us for a two-week winter externship. We look forward to properly welcoming everyone with an office happy hour at the end of the week!